It is becoming more critical for developed countries to deliver long-term and financially sustainable healthcare services to an expanding ageing population, especially in the area of residential aged care. There is a general consensus that innovations in the area of Wireless Sensor Networks (WSNs) are key enabling technologies for reaching this goal. The major focus of this chapter is on WSN design considerations for ubiquitous wellness monitoring systems in residential aged care facilities. The major enabling technologies for building a pervasive WSN will be explored, including details on sensor design, wireless communication protocols and network topologies. Also examined are various data processing methods and knowledge management tools to support the collection of sensor data and their subsequent analysis for health assessment. Future systems that incorporate the two aspects of wellness monitoring, vital signs and activities of daily living (ADL) monitoring, will also be introduced. In developed countries the lifespan of the population is lengthening and the elderly group constitutes an increasingly significant portion of the world population. In 2007, statistics from Australia, the European Union, Japan and the United States showed that people aged 65 years and above made up from 13% to 21% of the population in these areas (Australian Bureau of Statistics, 2008; Eurostat/US Bureau of the Census, 2008; Japan Statistics Bureau & Statistics Center, 2008; US Census Bureau, 2008). Assuming the current trends of fertility and mortality rates, the population in this age bracket is expected to grow to between 20% and 36% by 2050. Taking Australia as an example, the number of people aged 65 and over totals 2.75 million (or 13%). However, the more alarming statistic is that more than half the people in this group suffer from at least one chronic disease (Australian Bureau of Statistics, 2006) and as a result about one quarter of the annual government spending on healthcare services are used to provide corresponding treatment. Over the next 30 years, the estimated government healthcare expenditure will increase by 127%, amongst which spending on residential aged care is expected to experience the strongest growth (Australian Institute of Health and Welfare, 2008). This prediction coincides with Golant’s (2008) view that “a large increase in the numbers of older persons at risk of needing the supportive services offered in assisted living residences is relatively certain” (p.12) as he assessed the growth demographic factors affecting the future of residential aged care in the United States (Golant, 2008). All these statistics and trends lead to the conclusion that provision of long-term support for the healthcare needs of the elderly, especially in terms of residential aged care services, is needed but burgeoning costs also mean that such services must be provided in a more financially sustainable way. Recent innovations in the areas of sensor devices, wireless communication protocols and knowledge management are potential enabling information technologies for delivering future residential aged care services in an economic way. In fact the Commonwealth Government of Australia has recognized the promising benefits of these rising information technologies by piloting several key trial projects related to telehealth. These projects targeted the application areas of medication management (Australian Government, 2007a) and clinical well-being monitoring (Australian Government, 2007b; Branko G. Celler, Basilakis, Budge, & Lovell, 2006). In simple terms, telehealth refers to the delivery of healthcare over distance. It covers a wide range of medical applications from remote surgery in a hospital to chronic disease management that takes place in a residential setting. 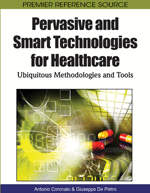 This chapter, is centered on a discussion of how wireless sensor networks (WSNs) can be deployed pervasively in a residential aged care facility to achieve ubiquitous monitoring so that the functional health status of the residents can be assessed. It is organized into several inter-related sections. In the background section, existing models of residential aged care are presented, as well as how the research effort in wellness monitoring can potentially revolutionize care approaches. This is followed by a systems architecture description of WSN technologies and a discussion on how these technologies can change the way residential aged care is delivered. Future trends in this area will then be illustrated through analysis of data taken from a simulated residential aged care environment conducted within the authors’ laboratories.